Provide comfort for the family of Matilda Pate with a meaningful gesture of sympathy. It is with great sadness that we announce the passing of Matilda “Nella” Pate who left us peacefully in Hamilton on January 16, 2019 at the age of 77 years. She is predeceased by her parents Filberto and Emilia Stancati, her brother Francesco Stancati and her husband Giovanni Pate, who passed away in 2005. She is survived by many friends and family members. Beloved mother of Teresa Albert (Phillip), Maria Baker (Mike), Daniela Cadete (Jorge) and Gianni Pate (Steve). 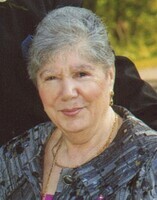 Cherished grandmother of Kristina, Phillip, Matthew, Sara, Lucas and many great grandchildren. Dear sister of Angelina, Vittorio, Giovanni and Antonio. Cremation has taken place. Visitation will be held at P.X Dermody Funeral Home at 796 Upper Gage Avenue on Sunday January 27 from 2pm to 4pm with a service to follow in the funeral home chapel. In lieu of flowers, donations to the Heart and Stroke Foundation and Canadian Breast Cancer Foundation would be appreciated by the family. To send flowers in memory of Matilda "Nella" Pate, please visit our Heartfelt Sympathies Store. We encourage you to share your most beloved memories of Matilda here, so that the family and other loved ones can always see it. You can upload cherished photographs, or share your favorite stories, and can even comment on those shared by others. Provide comfort for the family of Matilda "Nella" Pate by sending flowers. So sorry for your loss, my deepest condolences to Theresa and all of her extended family.